Ballygally Castle is situated along the beautiful Antrim Coast of Northern Ireland. 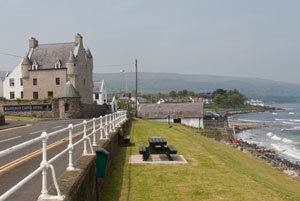 The castle hotel faces east across the bay with views of the sandy beach and the sea toward Scotland. You will enjoy the twenty-six mile drive north from Belfast on scenic Highway A2 as you go from town to town along the coast. Ballygally is six miles north of the ferry Port of Larne, at the south end of the nine Glens of Antrim. Ballygally Castle is a fine base for exploring Northern Ireland. Belfast, Carrickfergus Castle, the Glens of Antrim, the Ulster Way walking trail, Cairndhu Golf Course, the Carrick-A-Rede Rope Bridge, the Giant's Causeway, Bushmills Distillery, and Dunluce Castle are all nearby as you travel along the sea coast. The original castle was built in 1625 and is the only building of its age still used as a residence in Northern Ireland. If you stay in the hotel, you can even visit Lady Isabella, one of the resident ghosts, in her room! Ballygally Castle Hotel has 44 bedrooms, conference and banquet facilities, and a fine dining restaurant. When I stopped to visit last Spring, a couple was booking their wedding reception. The castle was built by James Shaw and his wife, Isabella Brisbane. James was from Scotland and came to Ireland to seek his fortune. He acquired land from the Earl of Antrim and built the castle. The castle was built for defense as well as for living quarters. Thick walls, a steep roof, and loopholes for muskets were all part of the design, yet the style was similar to a French chateau. There were inner and outer courtyards including stables, coach houses and a brew-house. The resident ghost, Isabella, is said to be the wife of James Shaw. As you recall, they were the original owners of the castle. It is rumored that James locked Isabella away in a tower room after she gave birth to a baby boy. She tried to escape and either fell or was thrown by her husband, or one of his thugs, to her death. She is said to be a friendly ghost, although I don't know why she would be. Guests can visit her tower room and have been known to hear strange sounds and to see an eerie green mist over the castle. Creepy! 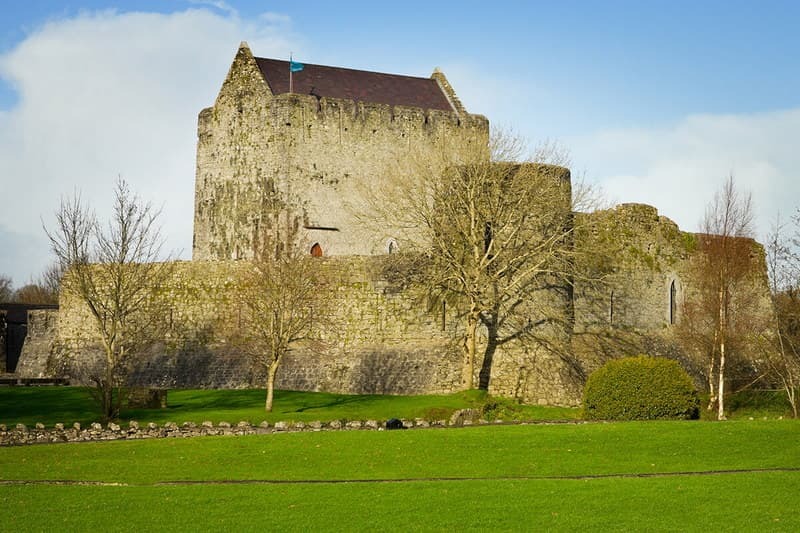 The castle was used during the Irish Civil Wars, the rebellion of 1641, and again as a fortress in the 18th century. Ownership was passed down through the generations. The last squire was William Shaw. In the 1800s the Shaw family lost their wealth and the estate was sold to the Agnew family. The castle served as a coastguard station for several years, and then as a private residence for the Reverend Classon Porter family, and the Moore family. 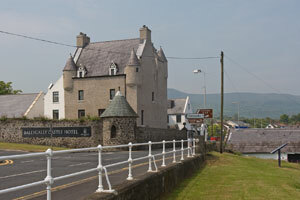 Ballygally Castle was then sold to Cyril Lord in the 1950s. Lord developed the castle into a hotel and sold it to the Hastings Hotel Group in the 1960s. 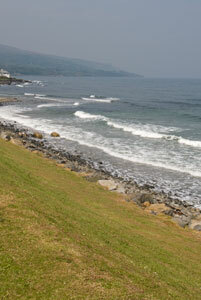 To get to the castle, you can take the scenic Antrim Coastal Road A2 north from Belfast right to the property. For a faster trip, you can take M2 from Belfast and take exit J5. 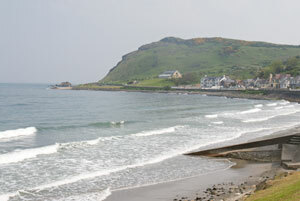 Then travel along the A8 to Larne, then A2 to Ballygally. There is car parking near the hotel.